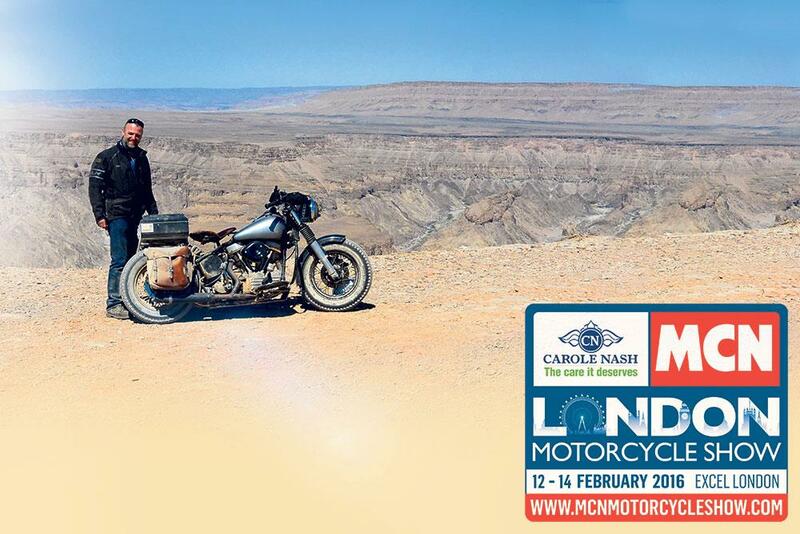 Eight of the world’s most influential motorcycle explorers will be starring at the Carole Nash MCN London Motorcycle Show on February 12-14. From Mondo Enduro and Terra Circa star Austin Vince to the Harley hardtail- riding Gareth Jones, the seasoned adventurers will be interviewed on stage, sharing stories, displaying their trusty steeds and giving out advice to budding travellers. So whether you’re planning a once-in-a-lifetime global adventure or your first trip across the Channel, you’ll be able to kick off your preparations in the show’s Adventure zone before picking up essentials in the crammed retail zone. The Yorkshireman has spent 14 years riding around the world on his trusty Africa Twin, passing through over 100 countries. Now in his 70s, he is one of the most experienced motorcycle travellers on the planet. Ian will be showing off his original and spinning some awesome yarns. Adventurer and author Sam Manicom has been travelling pretty much since his first trip at the age of 16. Within three months of starting to ride, he set off to travel the length of Africa on a BMW R80GS. This one-year trip turned into an eight-year, 200,000-mile journey across 55 countries around the world. After winning £5000 on the TV show Deal or No Deal, Graham promised host Noel Edmonds that he was going to spend his winnings on buying a bike and riding it to Mongolia. Graham kept his promise to Noel, buying a £750 Kawasaki KLR650 off eBay. 50,000 miles later it’s still going strong. In 1999 Gareth bought an old Harley Panhead, spent two years re-building it and then went off touring Europe and Morocco, improving and modifying it each year with the aim of achieving his lifelong dream of riding it through Africa. Gareth’s solo African trip in 2014 lasted six months and 12,000 miles. In 2012 Sean rode his Honda C90 all the way from Alaska to Argentina on what was a 33,000-mile adventure. Sean set a record for highest-ever Honda Cub, reaching 5706 metres above sea level. Sean Dillon is proof that you can do a big trip on a small bike and in doing so have plenty of fun along the way. In 1995 the Dutchman rode around the world on a Fireblade. In 2001 he went again, this time covering 155,000 miles on an R1. In 2013 Sjaak attempted something that had never been done before, riding an R1 to the very top of North America on a route that would take him across the ice of the frozen Beaufort Sea. In 1995 Austin Vince and his Mondo Enduro team were the first Europeans to get to the far eastern prison town of Magadan, producing what is arguably the finest bike documentary of all time. Ewan McGregor is a big fan and used Austin’s trips as the basis of his Long Way Round TV show. Spencer has worked his way around the world – so far he has travelled around 110 countries and the number increases every year. Spencer is a motorcycle adventurer by profession and was the first person to circumnavigate Africa solo and unsupported on a motorbike.